Former two-weight boxing champion Paul Malignaggi is no longer working with Team McGregor. The retired boxer, who was brought in to help current UFC lightweight champion Conor McGregor prepare for his boxing match with Floyd Mayweather, made headlines earlier this evening when he put “Mystic Mac” and his team on blast for their lack of ethics. The “Magic Man” was irate after someone in McGregor’s camp released the following sparring photos that showed Paul laid out on the canvas with Conor standing over him. 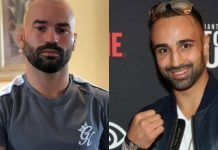 Malignaggi quickly took to social media where he spoke out against the accuracy of the photos and dared Conor McGregor to post the entire unedited video of their sparring session. Later this evening, Paul once again took to Twitter where he formally announced that he would no longer be part of the McGregor camp.